Freewing and Motion RC have done it again! Lightning strikes twice and following up on the wildly popular F-8 Crusader, we are excited to announce our latest addition to the Park Jet Series, the F-105D Thunderchief! Relentless in its bombing missions during the Vietnam War, the supersonic F-105 excelled as a single seat F-105D fighter bomber and a two seat F/G SEAD or “Wild Weasel” platform. Never before available in foam PNP format, with the release of this Freewing F-105D Thunderchief we are proud to commemorate the service and sacrifices of all the Thud’s crews who fought unbowed against terrible dangers. Optimized for affordability and accessibility, the Freewing F-105D truly delivers the fun factor for park jet pilots. Continuing the popularity of our Freewing Stinger 64, F9F Panther, F-22 Raptor, and F-8 Crusader, the F-105D is perfect for pilots seeking standoff scale appearance of a rarely modeled aircraft in an affordable and easy to own package. The Freewing 64mm F-105D Thunderchief is designed to be an ideal first hand launch EDF, for novice pilots wanting to learn how an EDF jet handles versus a propeller driven model aircraft of a similar size. The Thunderchief is surprisingly stable yet nimble, with axial rolls and predictable behavior. A shoulder mounted wing and embedded plastic “skid plate” along much of the belly protects the aircraft during carefree belly landings. Assembly is straightforward, and using only two servos minimizes weight, complexity, and cost. Like the F-8 Crusader, the F-105D Thunderchief is configured to be flown using a radio that has Elevon mixing, as each side’s aileron and elevator surface are connected together. The model’s low wing loading and manageable slow speed handling in the landing pattern negated the need for a heavy and costly variable incidence wing. The battery bay can also accommodate a small gyro for additional stabilization. Powered by an efficient 64mm 5 blade EDF fan unit, 30A ESC and 2627-4500kv brushless outrunner motor, the Freewing 64mm F-105D Thunderchief reaches a top speed of 116kph/72mph using a single inexpensive 3s 1000mAh-2200mAh lipo battery with XT60 connector. While designed with simplified flight control surfaces and intended for hand launches and belly landing on grass runways, an optional landing gear set is sold separately for steerable operation on paved runways. 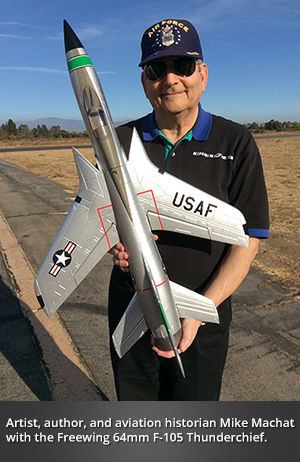 The F-105D Thunderchief has never been modeled in foam PNP before, and we know you’ll be as pleased as we are with how this model flies. Own this rare model today! Visit the Official Freewing 64mm F-105 Thunderchief Discussion Thread on HobbySquawk.com for additional photos, videos, reviews, and customer Q&A.